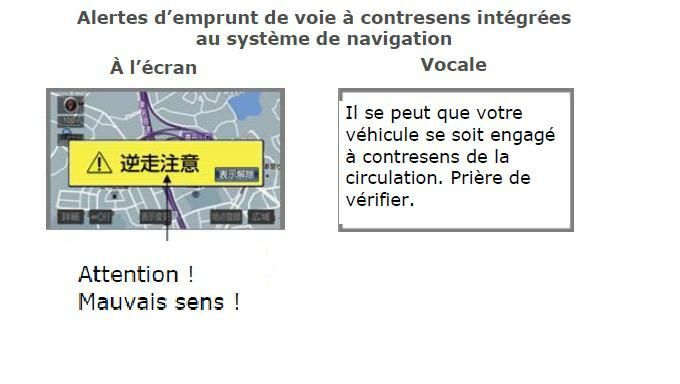 Toyota City,Japan, May 26, 2011—Toyota Motor Corporation (TMC) will add a function to its onboard navigation systems that gives on-screen and voice alerts to wrong-way drivers. Jointly developed with Aisin AW Co., Ltd. and Denso Corporation, the function monitors vehicle direction on highways and selected toll roads, including at tollgates, service area ramps, turn-offs and junctions. It will be incorporated into navigation systems available as dealer-installed options inJapanfrom June 1. The new function was made possible by advances in communications-based map-updating technology and in pinpoint position-recognition technology that uses information from GPS, gyro, vehicle-speed and other sensors to determine accurate vehicle movement. In recent years in Japan, approximately 1,000 wrong-way driving incidents are reported annually, with a higher percentage of senior drivers involved than in other kinds of traffic incidents. Going forward, TMC—striving to do its part in contributing to a society free of traffic accidents—remains committed to manufacturing people-friendly vehicles that improve the safety and peace of mind of drivers and pedestrians.